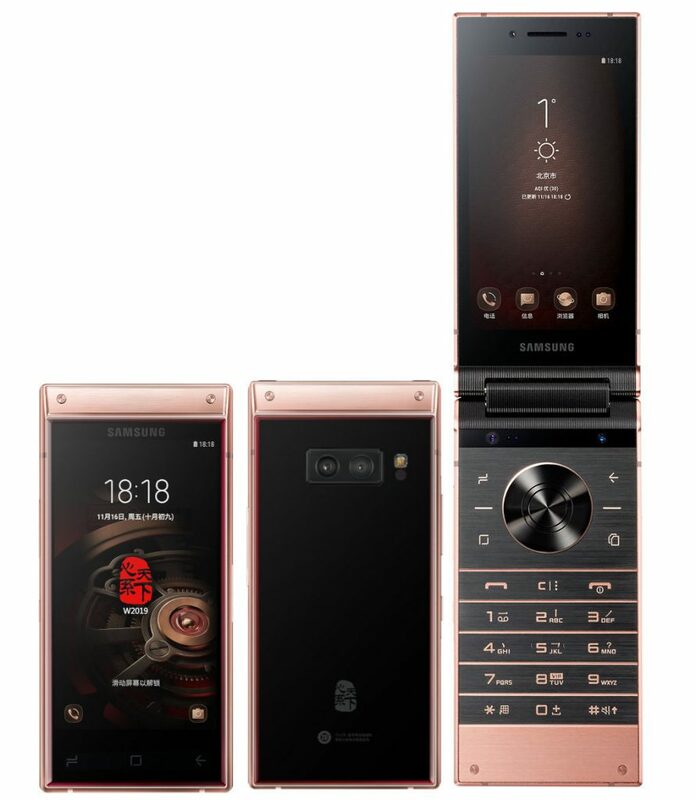 Samsung has just announced a new flip phone Samsung W2019 that is the successor to the Samsung W2018 launched last year in China. The W2019 is also a China-only phone like the W2018 and will be available with a price tag of 8,999 yuan which is around $2729 with 128GB inbuilt storage option and is on sale in China. It will be available with Rose Gold and Platinum color options. It comes with Dual AMOLED displays and also has dual rear cameras. The device comes powered by the Snapdragon 845 SoC and has 6GB of RAM. Let's check out the main specifications of the device. The Samsung W2019 flip-phone features a 3D glass body along with metal design and also has a side-mounted fingerprint sensor. It features 4.2-inch Super AMOLED dual displays with 1920 x 1080 pixels resolution and is powered by an octa-core Qualcomm Snapdragon 845 SoC with Adreno 630 GPU. It comes with 6GB of RAM and 128GB / 256GB internal storage options that are expandable up to 512GB with the help of a microSD card. It runs on the Android 8.0 (Oreo) OS out of the box and comes with Hybrid dual SIM slots (nano + nano/microSD). It features a dual rear camera with a 12-megapixel rear camera with LED Flash, f/1.5 or f/2.4 aperture, OIS along with a secondary 12-megapixel camera with f/2.4 aperture. It has an 8-megapixel front-facing camera with f/2.0 aperture and has a side-mounted fingerprint sensor. It has a 3,070mAh battery and comes with 4G VoLTE, Wi-Fi 802.11ac (2X2 MIMO), Bluetooth 4.2 LE, GPS + GLONASS, NFC, USB Type-C connectivity options. It measures 132.9 x 63.4 x 17.3mm and weight 257 grams. To recall, the Samsung W2017 flip-phone was launched with dual 4.2-inches AMOLED full HD displays (internal and external) with 1080 x 1920 pixels resolution and is powered by a 64-bit 2.35GHz octa-core Qualcomm Snapdragon 835 Mobile Platform (MSM 8998) with Adreno 540 GPU. It comes with 6GB of RAM and two storage options like the Extreme Edition that comes with 64GB of internal storage and the Collector Edition that comes with 256GB of inbuilt storage capacity. TENAA listing says that it will also have a MicroSD card slot with up to 256GB of expandable storage slot. It runs on the Android 7.1.1 Nougat OS out of the box comes with Bixby virtual assistant with a dedicated Bixby button and also has a Type-C port. It will be available with Elegant Gold and Platinum options. It will feature a 12-megapixel rear camera, as we discussed above, with an adjustable f/1.5 aperture lens and LED flash along with a 5-megapixel front-facing the camera. it comes with a 2300mAh built-in battery and comes with connectivity options such as 4G+, Bluetooth, WiFi IEEE 802.11 a / b / g / n / ac (2.4 GHz and 5. x GHz Dual-Band), NFC Type A/B, GPS, and other options. It has a fingerprint scanner available on the rear side. It measures 132.2x63.2x15.9mm and weighs in at 247 grams.